With all hope of reconciliation between Britain and her American colonies abandoned, Polly’s friend and mentor Benjamin Franklin returned to Philadelphia in 1775. The United States, at war with Britain, sent Franklin to Paris in 1777 to seek French aid and negotiate a treaty. Polly and Franklin continued to correspond as best they could during wartime, Polly forwarding news about Franklin’s friends in England. My letters are a kind of private newspaper, I give the articles just as they happen to occur without regard to order or connection. I fancy this kind will be most pleasing to you, as it will not require an answer, and will make you feel somewhat like having your English friends about you. Of course Polly described her children’s progress. She had a mind of her own and did not hesitate to go against custom when it seemed sensible to do so. She refused to dress her daughter in stays for example. Contrary to fashion, and consequently to the opinion of most people (you know in some points I am very obstinate) I keep her without stays, by which means her shape retains its natural grace; being unconfined, and her motions free, her health too is preserved. At length we are in Peace, God be praised; & long, very long may it continue. All Wars are Follies, very expensive & very mischievous ones. When will Mankind be convinc’d of this, and agree to settle their Differences by Arbitration? Were they to do it even by the Cast of a Dye, it would be better than by Fighting & destroying each other. …My love to William and Thomas and Eliza, and tell them I miss their cheerful prattle. . . . I have found it very triste breakfasting alone, and sitting alone, and without any tea in the evening. Polly was uncertain about where her children would be most likley to meet with success. Franklin offered this advice. With regard to the future Establishment of your Children, which you say you want to consult me about, I am still of Opinion that America will afford you more Chances of doing it well than England. All the means of good Education are plenty there, the general Manners more simple & pure, Temptations to Vice and Folly fewer, the Profits of Industry in Business as great and sure as in England; and there is one Advantage more which your Command of Money will give you there, I mean the laying out a Part of your Fortune in new Land, now to be had extreamly cheap, but which must be increas’d immensely in Value before your Children come of Age, by the rapid Population of the Country. If you should arrive there while I live, you know you may depend on every Assistance in my Power to afford you, and I think my Children will have a Pleasure too in serving their Father’s Friend. I do not offer it as a Motive that you will be much esteem’d and respected there, for that you are & must be every where; but give me leave to flatter myself that my being made happier in my last Years by your Neighbourhood and Society, may be some Inducement to you. Hewson did relocate to America with her children and lived in Philadelphia. Benjamin Franklin lent her some money, $185.30, in January of 1787 to help her get settled. During Franklin’s last illness, when his pain eased, Polly read to him from Johnson’s Lives of the Poets. Franklin died in 1790, age 84. Polly’s children did indeed do well in the United States. William Jr. obtained some land and became a farmer, Thomas became a medical doctor, and Elizabeth married an American. Franklin’s “surrogate daughter” Polly died the 14th of October 1795 aged 56. Carl Van Doren, Benjamin Franklin (New York: Viking Press, 1938), 638, 738, 776. Autograph letter signed (“B. 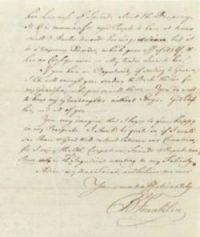 Franklin”) to Mary “Polly” Hewson, Passy, 13 April 1782.